At the Super Bowl XLIII pep rally at Heinz Field. The Steelers renewed quarterback Ben Roethlisberger's contract with an eight-year, $102 million agreement, the largest in franchise history. The team re-signed Max Starks to the largest single-year deal in franchise history, despite him not being a starter during the 2007 season. Nate Washington, Chris Kemoeatu, and Trai Essex also agreed to one-year deals. Seven-year center Justin Hartwig and running back Mewelde Moore were signed to multi-year deals, and linebacker Keyaron Fox agreed to a one-year deal. Entering the season, 14 players were in the final year of their contracts. During the Pittsburgh Penguins run for the Stanley Cup multiple members of the Steelers showed support for the cross-town team. Ben Roethlisberger attended Stanley Cup Finals games in Detroit, where he and the Steelers won Super Bowl XL three years prior. Mike Tomlin watched Game Six of the finals outside Mellon Arena, along with 3,000 other fans, on a JumboTron which had been erected for fans unable to acquire tickets to the sold-out game. 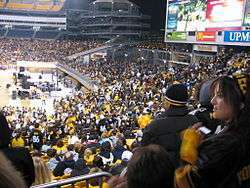 Kevin Colbert, Charlie Batch, and Tomlin attended many games throughout the regular season. In September, Penguins' coach Michel Therrien attended the Steelers' first game of the season. We're ready. I know that I feel good, and I can speak for the team. We've been practicing, gone through the preseason, and it's time to put what we've been practicing to work. Entering the first week of the season, players voted Ben Roethlisberger, Hines Ward, James Farrior, and Jeff Reed team captains. Farrior, James Harrison, and Troy Polamalu were voted to represent the Steelers at the 2009 Pro Bowl. James Harrison set the Steelers' franchise single-season record for sacks, surpassing Mike Merriweather's previous record of 15 sacks in 1984. Harrison also became the first undrafted player to win the NFL's Defensive Player of the Year Award. He was the fifth Steeler to win the award—the first since Rod Woodson in 1993. Harrison and Polamalu were also voted to the NFL's All-Pro team. The Steelers' defense tied the 1973 Los Angeles Rams record by holding 14 consecutive opponents under 300 yards of total offense. The defense finished ranked first in the league in total and passing yards given up and second in rushing yards. For the fifth time in his career Hines Ward received for over 1,000 yards throughout the season. The team's offense ranked 22nd in overall offense, 17th in passing, and 23rd in rushing. Rashard Mendenhall was the team's only rookie to start a game; the fewest rookie starts of any team in the league. In the second half, Parker scored his third touchdown of the game—surpassing his touchdown total for the entire 2007 season—and was named the AFC offensive player of the week for his performance. Pittsburgh's defense held Houston to six yards on their ensuing drive and the Steelers drove 80 yards to take a 35–3 lead. The Texans scored two touchdowns in the final quarter, but Pittsburgh's James Harrison led the team with three sacks—forcing a fumble on the third—and the Steelers won their first game of the season starting out 1–0. A 48-yard pass from Roethlisberger to Santonio Holmes and a 48-yard field goal from Jeff Reed on the team's second drive of the second half brought the score to 10–0. The Browns' Phil Dawson converted two consecutive field goals, to pull Cleveland within four points with 3:21 remaining. After a fourth down stop, Cleveland's offense took over with 26 seconds remaining, but failed to gain yardage as time expired. With the win, the Steelers increased their win streak over the Browns to 10 consecutive games—the longest current winning streak over a single opponent in the NFL. With the win the Steelers improved to 2–0 and led the AFC North by 1/2 a game ahead of the Ravens. A third quarter diving Troy Polamalu interception, on Kevin Kolb's first NFL pass, was named a "Can't Miss Play" by NFL Network. The Steelers did not capitalize, punting two more times in the third quarter. The Eagles entered the final quarter leading 10–6, and added two more points when Roethlisberger was called for Intentional grounding while in the end zone. Roethlisberger was forced to leave the game after his hand was stepped on in the final quarter. Offensive coordinator Bruce Arians took responsibility for the offense's performance. "Anybody who wants anybody to blame for Philadelphia, you just blame me," Arians stated, "and then we can get ready for Baltimore." The Steelers have won 14 consecutive Monday night games at home. Donning their throwback uniforms, the Steelers played the Baltimore Ravens in their first Monday Night game of the season. Multiple Steelers starters did not play in the game, due to various injuries. After a 3–3 first quarter, Baltimore took a ten-point lead into half time with a field goal and touchdown pass in the second quarter. Rashard Mendenhall—in his first NFL start—left the game in the third quarter with a season-ending shoulder injury. On Pittsburgh's third drive of the half, Roethlisberger connected with Santonio Holmes for a 38-yard touchdown pass. On the first play of Baltimore's ensuing drive, James Harrison's forced fumble was picked up by LaMarr Woodley and returned 7 yards for a touchdown. The two touchdowns within 15 seconds took the Steelers from ten points behind to four points ahead. In the final quarter, the Steelers' offense was stopped on the one yard line and Reed kicked his second field goal of the night. Baltimore drove 76 yards and tied the game with a touchdown. Neither team was able to score on their final drive as the regulation clock expired. The Steelers used their bye week to rest injured players including Brett Keisel, Willie Parker, Jeff Reed, and Ben Roethlisberger. The team hosted an event to honor wounded veterans of Operation Enduring Freedom and Operation Iraqi Freedom at Heinz Field. Players signed autographs and held on-field drills with the veterans, while soldiers and Marines spoke of their experiences. Chris Hoke, who attended the event said, "These are the people who fight for us to have our freedom and be who we are as Americans. To come out here and spend a couple hours with them and hear their stories is unbelievable. There's nothing better than this." Willie Parker was expected to return after missing two games, but aggravated his knee injury during a weekday practice and missed the game. Pittsburgh received the opening kickoff and drove 75 yards to open the scoring with a 2-yard touchdown pass from Ben Roethlisberger to Mewelde Moore to put the Steelers up 7–0. The Steelers' defense forced the Bengals offense into five consecutive three-and-outs, before the Bengals scored on their final possession of the opening half. The 5-yard pass from Ryan Fitzpatrick to Chad Johnson brought the Bengals within three points of the Steelers, who added a field goal from Jeff Reed. Pittsburgh added their second touchdown of the game on their opening drive of the second half when Moore rushed to the left side for 13 yards. Cincinnati retaliated on their ensuing drive adding a field goal from Dave Rayner. The Steelers scored three consecutive touchdowns in the final quarter, while holding the Bengals scoreless. At 8:26 of the fourth quarter Roethlisberger connected with Nate Washington for a 50-yard touchdown pass. Pittsburgh's Moore scored his third touchdown of the day—his second rushing—and Hines Ward's 16-yard touchdown reception gave the Steelers 31 points to the Bengals' ten. Moore finished the game with 120 yards rushing, while Santonio Holmes lead the Steelers with 89 receiving yards. The Colts kicked a 36-yard field goal in the third quarter to tie the game at 17. A Steelers field goal in the final quarter gave them a three-point lead. The Colts scored on Peyton Manning's third touchdown pass of the game to take the lead with 3:10 remaining in regulation. The Steelers drove from their own 27 yard line, but were unable to score. Pittsburgh entered week eleven with starters having missed 31 games due to injuries. The San Diego Chargers scored first, and led 7–0 after the first quarter of play. On the second play of the second quarter, the Steelers' James Harrison forced a fumble in the endzone, then forced a safety by tackling Marcus McNeill after he had recovered the fumble. Jeff Reed converted on a field goal as time expired on the first half, pulling the Steelers within two points. Reed kicked his second field goal of the game from 41-yards to give the Steelers the lead going into the final quarter. The Chargers drove 74 yards on 17 plays, converting on a field goal to give them the lead again, with 6:45 remaining. On the Steelers' ensuing drive, the offense drove 73 yards and Reed converted on his third field goal of the day, giving the Steelers an 11–10 lead with 15 seconds remaining in regulation. The Chargers attempted to score on their final play, but Troy Polamalu forced and recovered a fumble, returning it for a touchdown. The call was reversed when the officials ruled that San Diego had made an illegal forward pass. After the game, head referee Scott Green admitted that the touchdown should have been counted. With the touchdown not counted the final score kept Pittsburgh under the 5 point spread by which they were favored, and resulted in over $32 million being lost in bets. The game was the first regular season game in NFL history to end with a final score of 11–10. A Tony Romo touchdown pass in the third quarter gave the Cowboys their first lead of the game. The lead was extended when Nick Folk converted his second field goal of the day, putting the Cowboys up 13–3 as the game entered the final quarter. Reed converted his second field goal of the game, bringing the Steelers within seven points with 7:20 remaining in regulation. On the Steelers next drive, Ben Roethelisberger threw a touchdown pass to Heath Miller—tying the game with 2:04 remaining. Deshea Townsend intercepted Romo's next pass and returned the ball 25 yards, scoring a touchdown to give the Steelers a seven-point lead, which they held to the end of the game. Entering their second game of the season against Baltimore, the Steelers' defense ranked first in the league, while the Ravens' defense ranked second. "We're going to win by any means necessary. If the defense has to score, if the special teams have to kick in a score, or if the offense has to score 50 points – whatever it takes to win," stated James Harrison prior to the game. Both teams were held scoreless before a record crowd at M&T Bank Stadium until a Baltimore field goal gave the Ravens a 3–0 lead at 12:34 of the second quarter. 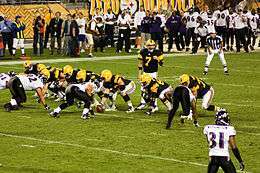 Pittsburgh tied the game on a Jeff Reed field goal; Matt Stover converted a second time to give the Ravens a three-point lead at halftime. Stover kicked his third field goal of the game in the third quarter, extending their lead to six points. In the final quarter, Reed kicked his second field goal of the game to put the Steelers within three points. On the Steelers final drive of the game, the offense drove 92 yards over 2:53, with Ben Roethlisberger completing a touchdown pass to Santonio Holmes with 50 seconds remaining. The Ravens embarked on one more drive, but the Steelers second interception of the game prevented them from scoring. With the victory the Steelers won their second consecutive AFC North title and clinched a first round bye and became the first AFC franchise to amass 550 wins. In the second half, Ben Roethlisberger threw his second touchdown pass of the game—to Hines Ward—to give the Steelers their only lead of the game. After a 21-yard touchdown run on Tennessee's ensuing drive, the Titans entered the final quarter with a three-point lead. The Titans scored two touchdowns in the final quarter, and the Steelers were unable overcome two Roethlisberger fumbles and two interceptions throughout the game. Their 12–4 regular season record gave the Steelers a second-place finish in the AFC. Along with the Tennessee Titans, who finished with the best record in the AFC, the Steelers received a bye during the opening week of the post-season. The 2008 season was the seventh of the past 16 that the Steelers were the first or second seed in the AFC entering the playoffs—never winning the Super Bowl during those seasons. Pittsburgh defeated the San Diego Chargers in the Divisional round, giving up a franchise post-season low of 15 rushing yards. The victory was head coach Mike Tomlin's first in the post-season. The Steelers defeated the Baltimore Ravens in the AFC Championship Game. The Steelers won Super Bowl XLIII over the NFC Champion Arizona Cardinals on February 1. The team rested on December 29—the day following their final regular-season game. They began preparations for their first post-season game on Tuesday, December 30 through Thursday, January 1, before three days of weekend rest. Roethlisberger did not practice until Monday, January 5—Tomlin stated of the injury, "We will proceed slowly with him because we have that luxury. But we feel comfortable with where he is relative to Sunday and where he’s capable of being next week." Although the January 1 practice was expected to be normal, Tomlin allowed players to leave after team meetings and a walk-through. Multiple Steelers stated that they would watch the games of the Wild Card round. Some including James Farrior and Ryan Clark watched as fans; however, Chris Hoke said, "I will be watching the guys I am going against... That is how I watch it." Pittsburgh hosted the Baltimore Ravens—who defeated the Miami Dolphins and Tennessee Titans in the Wild Card and Divisional rounds respectively—for the AFC Championship Game. During the week before the game, Pittsburgh mayor Luke Ravenstahl temporarily changed his name to Luke Steelerstahl in order to remove the "Raven". Though the change was not official the mayor did comment that "As soon as [he] heard [the idea], [he] thought it was a great idea." 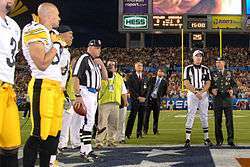 Jeff Reed concluded the first drive of Super Bowl XLIII with a field goal—giving the Steelers a 3–0 lead over the Arizona Cardinals. Gary Russell scored on a 1 yard touchdown rush on the Steelers' second drive and the Cardinals responded by scoring a touchdown on the ensuing drive. On the final play of the first half James Harrison intercepted a pass from Kurt Warner and returned it 100 yards for a touchdown. As he did in the first quarter, Reed scored the sole points of the third quarter giving the Steelers a 20–7 lead entering the final quarter. The Cardinals scored three consecutive times in the fourth quarter—with two Larry Fitzgerald touchdown receptions and a Steelers' holding call in the endzone that resulted in a safety—to give them a 23–20 lead with 2:37 remaining in regulation. Pittsburgh drove 78 yards in 2:02 and scored on a touchdown pass from Ben Roethlisberger to Santonio Holmes. The Steelers four point lead held as time expired and the Pittsburgh Steelers became the first team to win six Super Bowl titles. ↑ Dvorchak, Robert (December 25, 2008). "Steelers name Harrison MVP". Pittsburgh Post-Gazette. Archived from the original on January 8, 2009. Retrieved December 26, 2008. ↑ Bouchette, Ed (December 18, 2008). "Steelers Notebook: Bailey selected as team's top rookie". Pittsburgh Post-Gazette. Archived from the original on December 21, 2008. Retrieved December 19, 2008. ↑ "NFL Power Rankings: May 2008 edition". ESPN. Archived from the original on May 17, 2008. Retrieved June 2, 2008. ↑ "Fans pick Tomlin as NFL coach of the year". Pittsburgh Tribune-Review. January 29, 2009. Archived from the original on February 1, 2009. Retrieved January 30, 2009. ↑ "Fans vote Steelers' Tomlin coach of the year". Pittsburgh Post-Gazette. January 29, 2009. Archived from the original on February 1, 2009. Retrieved January 31, 2009. 1 2 2008 Pittsburgh Steelers Media Guide. ↑ 2009 Pittsburgh Steelers Media Guide. ↑ "2008 Pittsburgh Steelers". Pro-Football-Reference.com. Retrieved 2014-12-27. ↑ "Roethlisberger Faneca agrees to five-year, $40 million deal with Jets". ESPN. February 3, 2008. Archived from the original on April 3, 2008. Retrieved March 25, 2008. ↑ "Pittsburgh Steelers Transactions: Week of Feb 24". Pittsburgh Steelers Transactions. NFL. February 24, 2008. Retrieved May 31, 2008. ↑ "Pittsburgh Steelers Transactions: Week of March 2". Pittsburgh Steelers Transactions. NFL. Retrieved May 31, 2008. ↑ Smith, Michael (February 3, 2008). "Roethlisberger gets more than $36 million in guarantees in new deal". ESPN. Archived from the original on March 5, 2008. Retrieved February 3, 2008. ↑ Bouchette, Ed (June 9, 2008). "Starks hopes to make big impact". Pittsburgh Post-Gazette. Archived from the original on June 12, 2008. Retrieved June 10, 2008. ↑ "Pittsburgh Steelers Transactions". NFL. April 21, 2008. Archived from the original on May 4, 2008. Retrieved May 31, 2008. 1 2 Sports Xchange (May 30, 2008). "Pittsburgh Steelers Strategy and Personnel". Fox Sports (USA). Archived from the original on June 22, 2008. Retrieved June 2, 2008. ↑ Harris, John (July 27, 2008). "Steelers facing contract issues". Pittsburgh Tribune-Review. Archived from the original on August 4, 2008. Retrieved July 27, 2008. ↑ Bouchette, Ed (April 28, 2008). "Steelers draft RB from Illinois, WR from Texas to protect Big Ben". Pittsburgh Post-Gazette. Archived from the original on May 1, 2008. Retrieved April 27, 2008. ↑ Teresa Varley (April 30, 2008). "Roethlisberger gets his wish". Steelers.com. Archived from the original on August 8, 2008. Retrieved June 2, 2008. 1 2 "2008 NFL Draft: Bruce Davis". Steelers.com. Archived from the original on June 1, 2008. Retrieved June 3, 2008. 1 2 3 "Steelers Select Seven Players in 2008 NFL Draft". Steelers.com. Archived from the original on June 1, 2008. Retrieved June 3, 2008. ↑ "2008 NFL Draft: Tony Hills". Steelers.com. Archived from the original on May 25, 2008. Retrieved June 3, 2008. ↑ "2008 NFL Draft: Dennis Dixon". Steelers.com. Archived from the original on May 31, 2008. Retrieved June 3, 2008. ↑ "2008 NFL Draft: Mike Humpal". Steelers.com. Archived from the original on June 17, 2008. Retrieved June 3, 2008. ↑ "2008 NFL Draft: Ryan Mundy". Steelers.com. Archived from the original on May 28, 2008. Retrieved June 3, 2008. ↑ Bouchette, Ed (November 14, 2007). "Tomlin vows to shore up deficiencies in kickoff, punt coverage". Pittsburgh Post-Gazette. Archived from the original on March 28, 2008. Retrieved April 2, 2008. 1 2 "Director of Football Operations and Coach Mike Tomlin". Steelers.com. April 27, 2008. Archived from the original on June 17, 2008. Retrieved June 3, 2008. ↑ Mike Tomlin (April 28, 2008). Tomlin on Steelers' Draft (Interview). NFL Network. Event occurs at 2:41. Archived from the original on May 1, 2008. Retrieved June 2, 2008. ↑ Bouchette, Ed (April 28, 2008). "Steelers sign a dozen rookie free agents". Pittsburgh Post-Gazette. Archived from the original on May 1, 2008. Retrieved April 29, 2008. ↑ Bouchette, Ed (July 25, 2008). "Steelers sign top picks Mendenhall and Sweed". Pittsburgh Post-Gazette. Retrieved July 25, 2008. 1 2 "Steelers hoping Parker, rookie Mendenhall can provide 1–2 punch". NFL. Associated Press. May 5, 2008. Retrieved May 31, 2008. ↑ Scott Brown. Steelers mini-camp. Pittsburgh Tribune-Review. Event occurs at 0:04. Archived from the original on June 5, 2008. Retrieved June 5, 2008. 1 2 3 Walker, James (May 6, 2008). "Parker happily showing Mendenhall the Steelers' way". ESPN. Archived from the original on May 10, 2008. Retrieved June 2, 2008. ↑ Mike Tomlin. Camp wraps up. Pittsburgh Tribune-Review. Retrieved June 5, 2008. ↑ Bouchette, Ed (June 12, 2008). "Holmes pans offseason drills". Pittsburgh Post-Gazette. Archived from the original on June 12, 2008. Retrieved June 12, 2008. ↑ Scott Brown (2008). Steelers mini-camp. Pittsburgh Tribune-Review. Archived from the original on June 5, 2008. Retrieved June 5, 2008. 1 2 Bouchette, Ed (June 5, 2008). "Two fights develop; it's hockey day for Steelers". Pittsburgh Post-Gazette. Archived from the original on June 8, 2008. Retrieved June 5, 2008. 1 2 Varley, Teresa (June 6, 2008). "Pleased with their progress". Steelers.com. Archived from the original on June 9, 2008. Retrieved June 6, 2008. 1 2 Bouchette, Ed (June 13, 2008). "Tomlin says no jobs won in spring, without hitting". Pittsburgh Post-Gazette. Retrieved June 13, 2008. ↑ "Ultimate Standings: Fan Satisfaction Rankings". ESPN The Magazine. Archived from the original on May 18, 2008. Retrieved October 8, 2008. ↑ "Ultimate Standings: Fan Satisfaction Rankings – NFL". ESPN The Magazine. Archived from the original on May 2, 2008. Retrieved October 8, 2008. ↑ "ESPN ranks Steelers fans No. 1". Pittsburgh Tribune-Review. August 30, 2008. Retrieved August 30, 2008. ↑ Mosley, Matt (August 29, 2008). "NFL's best fans? We gotta hand it to Steelers (barely)". ESPN. Archived from the original on August 31, 2008. Retrieved August 30, 2008. ↑ Varley, Teresa (June 6, 2008). "Steelers have plenty of praise for the Penguins". Steelers.com. Archived from the original on June 9, 2008. Retrieved June 6, 2008. ↑ Bouchette, Ed (May 21, 2008). "Steelers Notebook: Big Ben gets Stanley Cup fever". Pittsburgh Post-Gazette. Archived from the original on May 26, 2008. Retrieved May 22, 2008. ↑ Majors, Dan (June 5, 2008). "Penguins' faithful assemble at arena". Pittsburgh Post-Gazette. Archived from the original on June 8, 2008. Retrieved June 6, 2008. ↑ Bouchette, Ed (May 22, 2008). "Steelers and Pirates supporting Penguins in big way". Pittsburgh Post-Gazette. Archived from the original on May 26, 2008. Retrieved May 22, 2008. ↑ "Pens Coach Has Big Football Weekend". PittsburghPenguins.com. September 8, 2008. Archived from the original on September 11, 2008. Retrieved September 8, 2008. ↑ "Rooney: 'Holmes Will Be Missed By Steelers Family'". KDKA. February 18, 2008. Archived from the original on June 30, 2008. Retrieved September 6, 2008. ↑ Gene, Collier (February 28, 2008). "Remembering Myron Cope: He spoke for Steelers Nation in a language all his own". Pittsburgh Post-Gazette. Retrieved June 6, 2008. ↑ "Former Steeler Dwight White dies". Pittsburgh Post-Gazette. June 6, 2008. Archived from the original on June 9, 2008. Retrieved June 6, 2008. ↑ Dulac, Gerry (September 5, 2008). "Posthumous tributes". Pittsburgh Post-Gazette. Archived from the original on September 8, 2008. Retrieved September 6, 2008. ↑ "Steelers pay tribute to legends". Pittsburgh Tribune-Review. September 8, 2008. Retrieved September 8, 2008. ↑ Dunlap, Colin (July 16, 2008). "Saint Vincent is in top shape for Steelers". Pittsburgh Post-Gazette. Retrieved July 16, 2008. ↑ Paterra, Paul (July 16, 2008). "St. Vincent puts on game-day face for Steelers". Pittsburgh Tribune-Review. Archived from the original on July 17, 2008. Retrieved July 18, 2008. ↑ Bouchette, Ed (July 27, 2008). "REPORTING DAY: Mike Tomlin heads into his second training camp". Pittsburgh Post-Gazette. Archived from the original on July 29, 2008. Retrieved July 28, 2008. ↑ "Steelers 2008 Training Camp Information". Steelers.com. Archived from the original on June 12, 2008. Retrieved June 13, 2008. ↑ "2008 Training camp schedule". ESPN. June 19, 2008. Archived from the original on June 22, 2008. Retrieved June 24, 2008. ↑ Stefano, Dan (June 15, 2008). "Summer vacation isn't always a break for Steelers". Pittsburgh Tribune-Review. Archived from the original on June 19, 2008. Retrieved June 16, 2008. ↑ Bouchette, Ed (June 5, 2008). "'08 camp to be one of shortest". Pittsburgh Post-Gazette. Archived from the original on June 8, 2008. Retrieved June 5, 2008. ↑ Brown, Scott (June 13, 2008). "Tomlin plans less demanding training camp". Pittsburgh Tribune-Review. Retrieved June 13, 2008. ↑ Harris, John (June 17, 2008). "Steelers D-line aging gracefully". Pittsburgh Tribune-Review. Archived from the original on June 17, 2008. Retrieved June 17, 2008. ↑ Harris, John (June 17, 2008). "Expect much from Mendenhall". Pittsburgh Tribune-Review. Archived from the original on June 17, 2008. Retrieved June 17, 2008. ↑ "Steelers' Sepulveda likely lost for the season". Pittsburgh Tribune-Review. July 29, 2008. Archived from the original on July 30, 2008. Retrieved July 30, 2008. ↑ Bouchette, Ed (July 30, 2008). "Torn ACL in right knee will keep left-footed punter out entire season". Pittsburgh Post-Gazette. Archived from the original on August 5, 2008. Retrieved August 1, 2008. ↑ "Steelers P Sepulveda out for season". Yahoo! Sports. July 29, 2008. Retrieved August 1, 2008. ↑ Bouchette, Ed (August 18, 2008). "Breaking camp". Pittsburgh Post-Gazette. Archived from the original on August 21, 2008. Retrieved August 21, 2008. 1 2 3 Brown, Scott (August 28, 2008). "Steelers nip Panthers with last second field goal". Pittsburgh Tribune-Review. Archived from the original on September 1, 2008. Retrieved August 30, 2008. 1 2 Bouchette, Ed (August 29, 2008). "It's a Reed-thin margin again". Pittsburgh Post-Gazette. Archived from the original on September 1, 2008. Retrieved August 30, 2008. ↑ Brown, Scott (August 8, 2008). "Steelers win preseason opener". Pittsburgh Tribune-Review. Archived from the original on August 11, 2008. Retrieved August 9, 2008. 1 2 "Box Score". Preseason Week One. NFL. August 8, 2008. Retrieved August 9, 2008. ↑ "Drive Chart". Preseason Week One. NFL. August 8, 2008. Retrieved August 9, 2008. ↑ Bouchette, Ed (August 8, 2008). "Batch exits Eagles game with fractured collarbone". Pittsburgh Post-Gazette. Archived from the original on August 9, 2008. Retrieved August 9, 2008. ↑ "Steelers Release 2008 Regular Season Schedule". Steelers.com. Archived from the original on June 18, 2008. Retrieved June 13, 2008. ↑ Harris, John (August 15, 2008). "First-team offense plays longer". Pittsburgh Tribune-Review. Retrieved August 19, 2008. ↑ Bouchette, Ed (August 14, 2008). "Steelers fall to Buffalo Bills, 24–21". Pittsburgh Post-Gazette. Retrieved August 19, 2008. ↑ Brown, Scott (August 15, 2008). "Steelers take step back in Toronto". Pittsburgh Tribune-Review. Retrieved August 19, 2008. ↑ Harris, John (August 24, 2008). "Steelers' defense looks ready to go". Pittsburgh Tribune-Review. Archived from the original on August 28, 2008. Retrieved August 24, 2008. ↑ Brown, Scott (August 24, 2008). "Steelers raise intensity against Vikings". Pittsburgh Tribune-Review. Archived from the original on August 24, 2008. Retrieved August 24, 2008. ↑ "Steelers sign Leftwich, Culpepper as QB fill-ins". NFL. Sporting News. August 9, 2008. Archived from the original on August 13, 2008. Retrieved August 10, 2008. ↑ "Steelers looking at QB Leftwich". NFL. Yahoo! Sports. August 9, 2008. Retrieved August 9, 2008. ↑ "NFL GameCenter: Pre-season Week 3". Box Score. NFL. August 23, 2008. Archived from the original on August 28, 2008. Retrieved August 25, 2008. ↑ Bouchette, Ed (August 24, 2008). "Reed the only kick in offense". Pittsburgh Post-Gazette. Archived from the original on August 26, 2008. Retrieved August 24, 2008. ↑ Fittipaldo, Ray (August 28, 2008). "Tonight last chance for some Steelers". Pittsburgh Post-Gazette. Retrieved August 28, 2008. ↑ "NFL GameCenter: Pre-season Week 4". Box Score. NFL. August 28, 2008. Archived from the original on September 1, 2008. Retrieved August 30, 2008. ↑ "Reed kicks Steelers past Panthers". NFL. Associated Press. August 29, 2008. Archived from the original on September 1, 2008. Retrieved August 30, 2008. ↑ Dulac, Gerry (August 31, 2008). "Reid, McBean among 22 cut from Steelers roster". Pittsburgh Post-Gazette. Archived from the original on October 7, 2008. Retrieved August 31, 2008. ↑ Brown, Scott (August 31, 2008). "Steelers' Reid, Drummond among final cuts". Pittsburgh Tribune-Review. Archived from the original on September 1, 2008. Retrieved August 31, 2008. ↑ Bouchette, Ed (September 1, 2008). "Nine join practice squad". Pittsburgh Post-Gazette. Archived from the original on September 4, 2008. Retrieved September 4, 2008. ↑ Bouchette, Ed (April 15, 2008). "Steelers 2008 schedule announced". Pittsburgh Post-Gazette. Archived from the original on April 20, 2008. Retrieved April 15, 2008. 1 2 Bouchette, Ed (June 8, 2008). "Ed Bouchette on the Steelers: Penguins will learn success has a price". Pittsburgh Post-Gazette. Archived from the original on June 10, 2008. Retrieved June 8, 2008. ↑ "Steelers, Colts have toughest 2008 schedules". ESPN. April 16, 2008. Retrieved June 13, 2008. ↑ "Standings". NFL. March 25, 2008. Archived from the original on March 26, 2008. Retrieved March 25, 2008. 1 2 Florio, Mike (July 12, 2008). "AFC North could produce a sub-.500 champion". Sporting News. Archived from the original on July 20, 2008. Retrieved July 18, 2008. ↑ "Steelers Release 2008 Regular Season Schedule". Steelers.com. April 15, 2008. Archived from the original on April 19, 2008. Retrieved April 16, 2008. ↑ "Steelers get maximum number of prime time games". Vindy.com. April 15, 2008. Archived from the original on May 6, 2008. Retrieved April 18, 2008. ↑ Bouchette, Ed (September 2, 2008). "Steelers Notebook: Team elects Roethlisberger, Reed to join list of captains". Pittsburgh Post-Gazette. Retrieved September 2, 2008. ↑ Brown, Scott (September 2, 2008). "Roethlisberger among four team captains". Pittsburgh Tribune-Review. Archived from the original on September 7, 2008. Retrieved September 2, 2008. ↑ Bouchette, Ed (December 17, 2008). "Steelers' Polamalu, Harrison, Farrior only picks for Pro Bowl". Pittsburgh Post-Gazette. Retrieved December 18, 2008. ↑ "Three Steelers Selected to the 2009 Pro Bowl Squad". PittsburghSteelers.com. December 16, 2008. Archived from the original on December 20, 2008. Retrieved December 18, 2008. 1 2 Bouchette, Ed (December 22, 2008). "Steelers Notebook: Sacks record doesn't ease sting of loss". Pittsburgh Post-Gazette. Retrieved December 22, 2008. ↑ "Harrison 1st undrafted AP Defensive Player of Year". ESPN. Associated Press. January 6, 2009. Retrieved January 6, 2009. ↑ "Harrison has death grip on defensive award". ESPN. Associated Press. January 5, 2009. Archived from the original on February 4, 2009. Retrieved January 5, 2009. ↑ "Polamalu, Harrison named to AP All-Pro team". Pittsburgh Tribune-Review. January 9, 2009. Retrieved January 9, 2009. ↑ "Steelers ride second straight fourth-quarter rally to back-to-back division titles". Curtain Call. ESPN. Associated Press. December 14, 2008. Archived from the original on December 18, 2008. Retrieved December 27, 2008. ↑ "Defensive Game Stats". Statistics. NFL. December 28, 2008. Archived from the original on December 23, 2008. Retrieved December 29, 2008. ↑ Robinson, Alan (December 29, 2008). "Playoffs await dominating Steelers defense". Yahoo! Sports. Archived from the original on June 4, 2011. Retrieved January 2, 2009. ↑ Brown, Scott (December 29, 2008). "Ward tops 1,000-yard mark in win". Pittsburgh Tribune-Review. Archived from the original on February 3, 2009. Retrieved December 29, 2008. ↑ "Offensive Game Stats". Statistics. NFL. December 28, 2008. Archived from the original on December 29, 2008. Retrieved December 29, 2008. ↑ Kirwan, Pat (March 22, 2009). "Draft buzz: Two offensive tackles separating themselves from the pack". NFL. Archived from the original on March 22, 2009. Retrieved March 23, 2009. ↑ The Steelers won the AFC North during the 2002, 2004, 2007, and 2008 NFL seasons. ↑ Borges, Ron (August 28, 2008). "AFC North preview: Anticipating two-horse race". NFL. Archived from the original on August 29, 2008. Retrieved August 30, 2008. ↑ "Pittsburgh Steelers (Consensus division finish: 1st)". ESPN. August 28, 2008. Archived from the original on August 31, 2008. Retrieved August 30, 2008. ↑ Borges, Ron (August 25, 2008). "Steelers preview: Face challenge from long-time rival". NFL. Archived from the original on August 29, 2008. Retrieved August 30, 2008. 1 2 "Browns game matters to Steelers' Tomlin – really". Lancaster Eagle-Gazette. Associated Press. December 24, 2008. Retrieved December 27, 2008. ↑ Ginsburg, David (December 28, 2008). "Ravens enter playoffs with 27–7 win over Jaguars". Yahoo! Sports. Retrieved December 29, 2008. ↑ Kay, Joe (December 28, 2008). "Bengals beat Chiefs 16–6 for third straight win". Yahoo! Sports. Archived from the original on December 31, 2008. Retrieved December 29, 2008. 1 2 3 "Big Ben gets concussion; Steelers rout Browns 31–0". Yahoo! Sports. Associated Press. December 28, 2008. Archived from the original on December 29, 2008. Retrieved December 28, 2008. ↑ "Crennel fired after Browns' 4-win season". ESPN. December 29, 2008. Archived from the original on January 26, 2009. Retrieved January 15, 2009. 1 2 "Week One GameCenter". Play-by-play. NFL. September 7, 2008. Retrieved September 8, 2008. 1 2 "National Football League Game Summary" (PDF). Houston Texans At Pittsburgh Steelers. NFL. September 7, 2008. Archived (PDF) from the original on September 16, 2008. Retrieved September 8, 2008. ↑ "Willie Parker". Career Stats. NFL. Retrieved September 8, 2008. ↑ Bouchette, Ed (September 10, 2008). "Steelers' Parker named AFC offensive player of the week". Pittsburgh Post-Gazette. Retrieved September 11, 2008. ↑ Brown, Scott (September 11, 2008). "Parker earns AFC honors". Pittsburgh Tribune-Review. Retrieved September 12, 2008. ↑ Varley, Teresa (September 12, 2008). "Rivalry remains strong". PittsburghSteelers.com. Archived from the original on September 13, 2008. Retrieved September 14, 2008. ↑ Dulac, Gerry (September 12, 2008). "Steelers Notebook: Roethlisberger limited in practice, should play". Pittsburgh Post-Gazette. Retrieved September 12, 2008. 1 2 "Week Two GameCenter". Play-by-play. NFL. September 14, 2008. Archived from the original on September 19, 2008. Retrieved September 15, 2008. 1 2 "National Football League Game Summary" (PDF). Pittsburgh Steelers At Cleveland Browns. NFL. September 15, 2008. Retrieved September 15, 2008. ↑ "Sore shoulder doesn't bother Roethlisberger; Steelers hold Browns without a TD". Fast Facts. ESPN. Associated Press. September 14, 2008. Archived from the original on September 18, 2008. Retrieved September 15, 2008. 1 2 Varley, Teresa (September 23, 2008). "Rough outing for Roethlisberger". Steelers.com. Archived from the original on September 25, 2008. Retrieved September 23, 2008. 1 2 "Week Three GameCenter". Play-by-Play. NFL. September 21, 2008. Retrieved September 23, 2008. 1 2 "National Football League Game Summary" (PDF). Pittsburgh Steelers At Philadelphia Eagles. NFL. September 21, 2008. Archived (PDF) from the original on October 12, 2008. Retrieved September 23, 2008. ↑ "Polamalu INT". Sprint Can't Miss Plays. NFL Network. September 21, 2008. Archived from the original on September 30, 2008. Retrieved September 23, 2008. ↑ Brown, Scott (September 26, 2008). "Arians accepts blame for struggles against Eagles". Pittsburgh Tribune-Review. Retrieved September 26, 2008. ↑ Dulac, Gerry (September 26, 2008). "Arians: I'll take blame for Philadelphia fiasco". Pittsburgh Post-Gazette. Archived from the original on September 26, 2008. Retrieved September 26, 2008. 1 2 "Steelers climb back, hang on for OT victory as Ravens lose first of season". ESPN. Associated Press. September 29, 2008. Archived from the original on October 2, 2008. Retrieved September 30, 2008. ↑ Varley, Teresa (September 26, 2008). "Steelers looking forward to home field advantage". Steelers.com. Archived from the original on September 27, 2008. Retrieved September 26, 2008. ↑ Varley, Teresa (September 23, 2008). "Parker one of three starters to miss Ravens game". Steelers.com. Archived from the original on September 25, 2008. Retrieved September 23, 2008. ↑ Bouchette, Ed (September 23, 2008). "Steelers Parker, Hampton injured, won't play Monday". Pittsburgh Post-Gazette. Retrieved September 23, 2008. ↑ "Steelers will be without RB Parker, DT Hampton against rival Ravens". ESPN. Associated Press. September 23, 2008. Archived from the original on September 24, 2008. Retrieved September 23, 2008. ↑ "Simmons, Mendenhall suffer season-ending injuries". NFL. Associated Press. September 29, 2008. Archived from the original on October 2, 2008. Retrieved September 30, 2008. ↑ Bouchette, Ed (September 30, 2008). "Steelers Notebook: Top pick, guard on IR, to miss rest of season". Pittsburgh Post-Gazette. Archived from the original on October 1, 2008. Retrieved September 30, 2008. 1 2 "Week Four GameCenter". Play-by-Play. NFL. September 30, 2008. Archived from the original on October 2, 2008. Retrieved September 30, 2008. 1 2 "National Football League Game Summary" (PDF). Baltimore Ravens At Pittsburgh Steelers. NFL. September 30, 2008. Archived (PDF) from the original on October 31, 2008. Retrieved September 30, 2008. ↑ Dulac, Gerry (October 1, 2008). "Steelers sign Russell; kicker Reed named player of week". Pittsburgh Post-Gazette. Retrieved October 1, 2008. ↑ "Week 5 – Steelers at Jaguars". Throwback Game of the Week. NFL. October 2, 2008. Archived from the original on October 3, 2008. Retrieved October 2, 2008. ↑ Dulac, Gerry (October 2, 2008). "Big Ben doesn't practice again". Pittsburgh Post-Gazette. Retrieved October 2, 2008. 1 2 "Week Five GameCenter". Play-by-Play. NFL. October 5, 2008. Archived from the original on October 9, 2008. Retrieved October 5, 2008. 1 2 "National Football League Game Summary" (PDF). Pittsburgh Steelers At Jacksonville Jaguars. NFL. October 5, 2008. Archived (PDF) from the original on October 31, 2008. Retrieved October 5, 2008. ↑ Varley, Teresa (October 8, 2008). "Roethlisberger AFC Offensive Player of the Week". Steelers.com. Archived from the original on October 11, 2008. Retrieved October 8, 2008. ↑ Week 5: Pittsburgh vs. Jacksonville Game of the Week (Television production). Jacksonville, Florida: National Football League. October 10, 2008. Retrieved October 10, 2008. ↑ Lolley, F. Dale (October 8, 2008). "Steelers getting healthy as Parker, Keisel return". Observer-Reporter. Retrieved October 8, 2008. ↑ Bouchette, Ed (October 8, 2008). "Injury list could trim with help of open date". Pittsburgh Post-Gazette. Archived from the original on October 11, 2008. Retrieved October 8, 2008. ↑ Varley, Teresa (October 8, 2008). "Saying thanks to true heroes". PittsburghSteelers.com. Archived from the original on October 11, 2008. Retrieved October 8, 2008. ↑ Price, Karen (October 8, 2008). "Steelers host wounded vets at Heinz Field". Pittsburgh Tribune-Review. Archived from the original on October 9, 2008. Retrieved October 8, 2008. ↑ Dulac, Gerry (October 17, 2008). "Parker won't play in Sunday's Steelers game". Pittsburgh Post-Gazette. Retrieved October 17, 2008. 1 2 "Week Seven GameCenter". Play-by-Play. NFL. October 19, 2008. Archived from the original on October 20, 2008. Retrieved October 19, 2008. 1 2 "National Football League Game Summary" (PDF). Pittsburgh Steelers At Cincinnati Bengals. NFL. October 19, 2008. Archived (PDF) from the original on October 31, 2008. Retrieved October 19, 2008. ↑ Dulac, Gerry (October 24, 2008). "Steelers' Parker likely a scratch against Giants". Pittsburgh Post-Gazette. Retrieved October 24, 2008. ↑ Corner, Jahmal; Greg Stutchbury (October 25, 2008). "Steelers place Holmes on inactive list". Reuters. Retrieved October 25, 2008. 1 2 "Week Eight GameCenter". Play-by-Play. NFL. October 26, 2008. Archived from the original on October 25, 2008. Retrieved October 26, 2008. 1 2 "National Football League Game Summary" (PDF). New York Giants At Pittsburgh Steelers. NFL. October 26, 2008. Archived (PDF) from the original on October 31, 2008. Retrieved October 26, 2008. ↑ "Obama, McCain on what to change in sports". Yahoo! Sports. Associated Press. November 3, 2008. Archived from the original on June 4, 2011. Retrieved November 4, 2008. 1 2 "Week Nine GameCenter". Play-by-Play. NFL. November 3, 2008. Archived from the original on December 9, 2008. Retrieved November 3, 2008. 1 2 "National Football League Game Summary" (PDF). Pittsburgh Steelers At Washington Redskins. NFL. November 3, 2008. Retrieved November 3, 2008. 1 2 "Week Ten GameCenter". Play-by-Play. NFL. November 9, 2008. Retrieved November 9, 2008. 1 2 "National Football League Game Summary" (PDF). Indianapolis Colts At Pittsburgh Steelers. NFL. November 9, 2008. Retrieved November 9, 2008. ↑ Bouchette, Ed (November 16, 2008). "Steelers: Injuries are never an excuse, but ...". Pittsburgh Post-Gazette. Retrieved November 17, 2008. 1 2 "Week Eleven GameCenter". Play-by-Play. NFL. November 16, 2008. Retrieved November 16, 2008. 1 2 "National Football League Game Summary" (PDF). San Diego Chargers At Pittsburgh Steelers. NFL. November 16, 2008. Archived (PDF) from the original on December 7, 2008. Retrieved November 16, 2008. ↑ Bouchette, Ed (November 17, 2008). "Steelers Notebook: Official admits mistake on play". Pittsburgh Post-Gazette. Retrieved November 17, 2008. ↑ "Referee says officials errantly voided Steelers TD". NFL. Associated Press. November 17, 2008. Archived from the original on December 9, 2008. Retrieved November 17, 2008. ↑ "Errant call in Steelers-Chargers affects betting". NBC Sports. November 17, 2008. Archived from the original on December 5, 2008. Retrieved November 17, 2008. ↑ Robinson, Alan (November 17, 2008). "Steelers beat Chargers in NFL's first 11–10 game". Yahoo! Sports. Retrieved November 17, 2008. 1 2 "Week Twelve GameCenter". Play-by-Play. NFL. November 20, 2008. Retrieved November 20, 2008. 1 2 "National Football League Game Summary" (PDF). Cincinnati Bengals At Pittsburgh Steelers. NFL. November 20, 2008. Archived (PDF) from the original on December 3, 2008. Retrieved November 20, 2008. 1 2 "Week Thirteen GameCenter". Play-by-Play. NFL. November 30, 2008. Archived from the original on December 3, 2008. Retrieved November 30, 2008. 1 2 "National Football League Game Summary" (PDF). Pittsburgh Steelers at New England Patriots. NFL. November 30, 2008. Archived (PDF) from the original on December 9, 2008. Retrieved November 30, 2008. ↑ Bouchette, Ed (December 8, 2008). "Steelers Notebook: Harrison ties sack record, but wants more". Pittsburgh Post-Gazette. Retrieved December 8, 2008. 1 2 "Week Fourteen GameCenter". Play-by-Play. NFL. December 7, 2008. Archived from the original on December 10, 2008. Retrieved December 7, 2008. 1 2 "National Football League Game Summary" (PDF). Dallas Cowboys at Pittsburgh Steelers. NFL. December 7, 2008. Archived (PDF) from the original on December 21, 2008. Retrieved December 7, 2008. ↑ "Top defenses square off for AFC North supremacy". NFL. Associated Press. December 11, 2008. Archived from the original on December 12, 2008. Retrieved December 11, 2008. 1 2 Bouchette, Ed (December 15, 2008). "Steelers Notebook: Game ends with some spit and a shove". Pittsburgh Post-Gazette. Archived from the original on December 18, 2008. Retrieved December 15, 2008. ↑ "Week Fifteen GameCenter". Play-by-Play. NFL. December 14, 2008. Archived from the original on December 17, 2008. Retrieved December 14, 2008. ↑ "National Football League Game Summary" (PDF). Pittsburgh Steelers at Baltimore Ravens. NFL. December 14, 2008. Archived (PDF) from the original on January 17, 2009. Retrieved December 14, 2008. ↑ "Another strong finish allows Steelers to take AFC North crown". NFL. Associated Press. December 14, 2008. Archived from the original on December 17, 2008. Retrieved December 15, 2008. ↑ Cherry, Gene; Ed Osmond (December 14, 2008). "Steelers claim AFC North title with dramatic win". Reuters. Archived from the original on December 16, 2008. Retrieved December 15, 2008. ↑ Bouchette, Ed (December 14, 2008). "Steelers take Ravens, 13–9". Pittsburgh Post-Gazette. Retrieved December 15, 2008. 1 2 "Week Sixteen GameCenter" (PDF). Play-by-Play. NFL. December 21, 2008. Archived (PDF) from the original on January 17, 2009. Retrieved December 21, 2008. 1 2 "National Football League Game Summary" (PDF). Pittsburgh Steelers at Tennessee Titans. NFL. December 21, 2008. Archived from the original on December 24, 2008. Retrieved December 21, 2008. ↑ "Roethlisberger taken off field on stretcher". Fox Sports (USA). Associated Press. December 28, 2008. Retrieved December 29, 2008. 1 2 "Week Seventeen GameCenter". Play-by-Play. NFL. December 28, 2008. Archived from the original on December 30, 2008. Retrieved December 28, 2008. 1 2 "National Football League Game Summary" (PDF). Cleveland Browns at Pittsburgh Steelers. NFL. December 28, 2008. Archived (PDF) from the original on February 4, 2009. Retrieved December 28, 2008. ↑ "Playoff picture". ESPN. December 28, 2008. Archived from the original on December 20, 2008. Retrieved December 29, 2008. ↑ Robinson, Alan (January 1, 2009). "Bye bye? Playoff bye not always good for Steelers". Yahoo! Sports. Archived from the original on June 4, 2011. Retrieved January 2, 2009. ↑ Collier, Gene (January 12, 2009). "Steelers throttle Chargers' run game". Pittsburgh Post-Gazette. Archived from the original on January 16, 2009. Retrieved January 12, 2009. ↑ Bouchette, Ed (January 11, 2009). "Steelers beat Chargers, 35–24, advance to AFC championship". Pittsburgh Post-Gazette. Retrieved January 12, 2009. ↑ Bouchette, Ed (December 29, 2008). "Steelers Notebook: Pass-happy Hines Ward makes his 800th catch". Pittsburgh Post-Gazette. Archived from the original on February 7, 2009. Retrieved December 29, 2008. ↑ "Roethlisberger practices, expects to play". ESPN. January 5, 2009. Retrieved January 5, 2009. ↑ Robinson, Alan (December 30, 2008). "Ben (Ben) headache? Steelers awaiting QB's return". Yahoo! Sports. Archived from the original on December 31, 2008. Retrieved January 2, 2009. ↑ Dulac, Gerry (January 2, 2009). "Steelers Notebook: Parker not expecting surgery". Pittsburgh Post-Gazette. Retrieved January 4, 2009. ↑ Varley, Teresa (January 2, 2009). "Steelers set to be spectators". PittsburghSteelers.com. Archived from the original on February 26, 2012. Retrieved January 4, 2009. ↑ Bouchette, Ed (December 28, 2008). "Steelers' first playoff game will be Jan. 11". Pittsburgh Post-Gazette. Retrieved December 29, 2008. 1 2 "Postseason 2008". Schedules. NFL. December 29, 2008. Archived from the original on December 29, 2008. Retrieved December 29, 2008. 1 2 "Divisional round GameCenter". Play-by-Play. NFL. January 11, 2009. Archived from the original on January 16, 2009. Retrieved January 11, 2009. 1 2 "National Football League Game Summary" (PDF). San Diego Chargers at Pittsburgh Steelers. NFL. January 11, 2009. Archived (PDF) from the original on February 5, 2009. Retrieved January 11, 2009. ↑ "Mayor's new name: Steelerstahl". ESPN. January 14, 2009. Archived from the original on January 18, 2009. Retrieved January 15, 2009. ↑ Boren, Jeremy (January 14, 2009). "Mayor changes name to 'Steelerstahl'". Pittsburgh Tribune-Review. Retrieved January 15, 2009. ↑ "Divisional round GameCenter". Play-by-Play. NFL. January 18, 2009. Archived from the original on January 20, 2009. Retrieved January 18, 2009. ↑ "National Football League Game Summary" (PDF). Baltimore Ravens at Pittsburgh Steelers. NFL. January 18, 2009. Archived (PDF) from the original on February 5, 2009. Retrieved January 18, 2009. ↑ "Super Bowl GameCenter". Play-by-Play. NFL. February 1, 2009. Archived from the original on February 4, 2009. Retrieved February 1, 2009. ↑ "National Football League Game Summary" (PDF). Pittsburgh Steelers at Arizona Cardinals. NFL. February 1, 2009. Archived (PDF) from the original on February 4, 2009. Retrieved February 1, 2009. 1 2 Dvorchak, Robert (February 2, 2009). "They're the Lords of the Rings". Pittsburgh Post-Gazette. Archived from the original on February 5, 2009. Retrieved February 2, 2009. ↑ "From tough background, Holmes emerges as Super Bowl MVP". NFL. Associated Press. February 1, 2009. Archived from the original on February 3, 2009. Retrieved February 2, 2009. ↑ Angel, Aron (February 1, 2009). "Harrison swings game the Steelers' way with interception return for TD". NFL. Archived from the original on February 3, 2009. Retrieved February 2, 2009. ↑ LaDow, Jessica; Jerome B. Sherman; Ed Blazina; Anya Sostek (February 3, 2009). 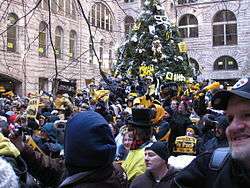 "Fandemonium greets Steelers parade". Pittsburgh Post-Gazette. Archived from the original on February 6, 2009. Retrieved February 3, 2009. ↑ Lord, Rich (February 3, 2009). "Council changes city's name to Sixburgh". Pittsburgh Post-Gazette. Archived from the original on February 6, 2009. Retrieved February 3, 2009.